Police arrested a 48-year-old man suspected of 30 mostly failed hold-ups of fast-food restaurants after allegedly using a gun in another pair of unsuccessful heists last Thursday, Dec. 30, in Laguna Beach. David Brian Mattson pleaded not guilty to a dozen felony counts of second-degree attempted robbery and a single felony count of second-degree robbery this week, according to Orange County court records. Mattson, who police say is homeless, was arrested at gunpoint outside the Village Mart Gas Station, at 120 S. Coast Highway, police Lt. Jason Kravetz said in a statement. An orange cap gun that was painted black was found in his pocket, he said. Sgt. Eric Lee collared Mattson by fortuitously positioning his vehicle at a downtown intersection and likely get-away zone to watch for a suspect that attempted a robbery at a Jack-in-the-Box earlier. Unbeknownst to Lee, the suspect was inside the business adjacent to him, Kravetz said. Mattson, who allegedly produced a handgun and ordered the Village Mart clerk to give him cash, left empty-handed when he saw the police car. As the sergeant realized the emerging customer matched the description of the Jack in the Box bandit, the clerk called out to Lee that the customer had a gun, according to police. Mattson apparently tried drive-through lane heists between Riverside and San Diego counties, but was apparently only successful at obtaining cash from one, said Kravetz. That held true in Laguna also. When a bandit confronted Jack-in-the-Box employees with a handgun and demanded money, they slammed the window shut and ran to the back of the restaurant, police said. 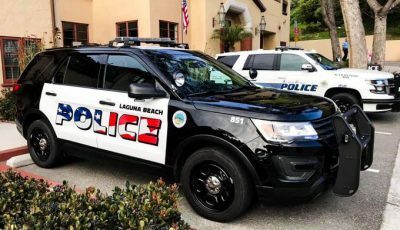 A 58-year-old Laguna Beach resident and critic of police conduct, who has had several verbal confrontations with officers in recent years, was arrested for allegedly making verbal threats and charged with a felony last Thursday, Sgt. Louise Callus said. The dispatcher, who had been walking downtown, had kept her back turned and walked away as Grossman attempted a conversation, Callus said. Grossman, who was held for $50,000 bail, has several times called the Indy to describe what he views as personal harassment by local officers. Traffic collision. 8:20 p.m. Coast Highway at Calliope. A 27-year-old Fresno woman suffered a broken collar bone, pelvis, and leg after she was hit by a vehicle while in a crosswalk and thrown 80 feet. The 27-year-old male driver, of San Diego, who was northbound on Coast Highway, was not charged in the incident. Found property. 5:25 p.m. 1000 block of Noria Street. A wallet, inside of a backpack that was stolen from an unlocked car last month, was discovered and turned over to police. Attempted burglary. 5:10 p.m. 100 block of Cliff Drive. An unknown person was attempted to break in, but left the area after hearing a baby crying. Grand theft. 4 p.m. 2200 block of Laguna Canyon Road. A victim of an earlier traffic collision, who was hospitalized for injuries, returned to retrieve the damaged vehicle to find $600 worth of stereo equipment missing. Ignoring the obvious. 10:27 a.m. Aliso Beach. Numerous surfers are in the water despite water-contamination warnings. Traffic stop. 1:14 p.m. 700 block of Laguna Canyon Road. Alfredo Jaimes Jr., 32, of Laguna Beach, was stopped for expired plates, but was arrested for allegedly possessing dangerous weapons and held for $20,000 bail. In the vehicle, police found an aerosol tear gas container and under the driver’s seat a 24-inch long side handle baton. Vandalism. 4:40 a.m. 300 block of Glenneyre. A car in the parking lot was keyed. Traffic stop. 1:46 a.m. 1000 block of Laguna Canyon Road. A 26-year-old Rancho Santa Margarita woman was arrested for DUI and held for $2,500 bail. Domestic violence. 10:01 a.m. 600 block of Glenneyre. Danielle Cavallucci, 34, of Laguna Beach, was arrested for suspicion of domestic violence and held for $50,000 bail. A boyfriend alleged she hit him in the nose. Warrant service. 5:58 p.m. 400 block of Bent Drive. Elizabeth Ann Gatelin, 34, of Laguna Beach, was arrested for two outstanding warrants and held for $10,000 bail. Grand theft. 9:24 a.m. 20000 block of Sun Valley Drive. A flood victim suspects her spouse in the theft of a cast iron planter that disappeared while she was away from home due to flooding. Vandalism. 4:31 a.m. 180 block of North Coast Highway. For the second time, oil was dumped at the entrance. Traffic stop. 3:32 a.m. Coast Highway and Montage. A 36-year-old Laguna Niguel resident was arrested for DUI and held for $2,500 bail. Traffic stop. 2:47 a.m. Bluebird Canyon Drive. A 40-year-old man, celebrating the New Year and his birthday, was stopped and arrested for DUI, but was released to a hospital due to an asthma attack that made breathing difficult. Traffic stop. 1:27 a.m. Reef Point. A 31-year-old El Monte man was arrested for DUI and held for $2,500 bail. Speed race. 1:18 a.m. Coast Highway at Aliso Circle. An 18-year-old Irvine man was arrested for DUI and held for $2,500 bail. Medical aid. 12:03 a.m. 300 block of Coast Highway. A 26-year-old Bakersfield man was arrested for being drunk in public and an outstanding DUI warrant after medical aid was sought unnecessarily. Traffic stop. 1:33 a.m. Oak Street. A 34-year-old Norwalk woman was arrested for suspicion of DUI and held for $2,500 bail. Vandalism. 9 a.m. Alta Laguna Park. The reservoir, signs and benches were discovered heavily tagged. Traffic stop. 9:25 p.m. Calliope. A 24-year-old Newport Beach woman was arrested for suspicion of DUI and held for $2,500 bail. Traffic stop. 12:53 a.m. Coast Highway and Viejo Street. 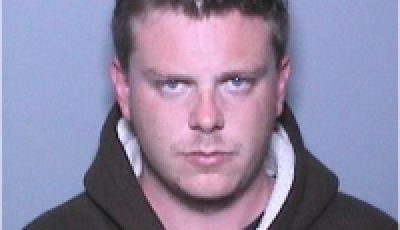 Christian Pierce Brown, 30, of Laguna Beach, was arrested for suspicion of DUI and possession of methamphetamine. He was held for $20,000 bail. Police said he was stopped for vehicle code violations.